Missouri Justice Project: Pigeon Pie, Anyone? The city of Maryville had a problem on its hands in late 1930, in the form of pigeons. Hoards of them. They seemed to be everywhere. Doing what pigeons do do. The sheriff caught the attention of the local newspaper, the Maryville Daily Forum. “The sheriff put on his hunting outfit, took his trusty rifle in his hand and went forth to rid the business district of the pigeon pest. This morning there were no pigeons to be seen and it looks as though the sheriff 'did his duty.'" 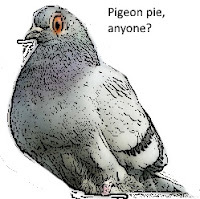 I'm not sure what pigeon pie tastes like, and personally I don't want to find out. "Sheriff Harve England is an excellent marksman; therefore, the prisoners at the county jail are benefiting by eating pigeon pie today." "The sheriff says that he shot forty-three pigeons yesterday, but could only get thirty-some-odd of them. 'The rest fell in places he could not reach.'" NOTE: Two years later Earl Gravens, a prisoner in the jail, absconded with Sheriff England's favorite hunting jacket during Gravens' escape. I wonder if he did it because it was cold out or maybe he was trying to spare his fellow inmates from any more pigeon pie?"